MOSCOW. Dec 25 (Interfax) – Consumer demand is the main driving force of a Russian economy that is slowing for internal reasons, Economic Development Minister Alexei Ulyukayev said in an interview with the Rossiya 24 TV channel. “The main problems are our domestic ones. Low investment activity now complements export limitations. The only part of this engine that is in working order is consumer demand,” Ulyukayev said. Wage growth is approximately 5.5%, real incomes are growing 4% and retail trade is rising by more than 4%. Investment fell 1.8% in January-November. “We expect to be in positive territory here by the end of the year, but it won’t be much at all, something like a statistical margin of error, maybe zero or zero plus,” he said. GDP grew 1.4% in the 11M and will grow 1.4%-1.5% in the year as a whole. “Growth is now 1.4%. It might be 1.5% for the year, but it is unlikely to be more,” he said. Inflation will be 6.4%-6.5%. “Inflation is 6.5% [in annual terms]. 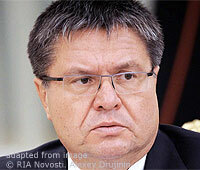 This figure is likely remain so by the end of the year, or perhaps it’ll be 6.4%,” Ulyukayev said. He said industry was showing zero growth. “Industrial growth is practically zero, but results for agriculture aren’t bad [up 6.8%], and this is giving some impetus to the overall result for GDP,” he said.